Wolfville, NS, March 19, 2019 – Acadia Divinity College (ADC) Board of Trustees is pleased to announce that the Reverend Dr. Anna M. Robbins has been named the 7th President of Acadia Divinity College and Dean of Theology of Acadia University. Dr. Robbins was chosen following a comprehensive and rigorous selection process, led by a presidential search committee comprised of faculty and board members. For two decades, Robbins has been a renowned speaker, leader, consultant, and teacher, who inspires initiative in ministry, innovation in theological education, and equips Christians to engage the world with curiosity and compassion. She will begin her six-year term as president on July 1, 2019. In 2012, Robbins joined ADC as Academic Dean, Director of Doctoral Studies, and Associate Professor of Theology, Culture and Ethics, and she later became the inaugural Director of the Andrew D. MacRae Centre for Christian Faith and Culture. 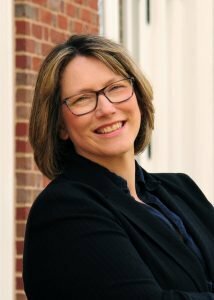 She was appointed the Dr. Millard R. Cherry Professor of Theology, Ethics and Culture in 2017. Prior to coming to ADC, Robbins was Senior Lecturer in Theology and Contemporary Culture at the London School of Theology (LST) in Northwood, UK, after completing her PhD at Aberystwyth, Wales. During her time at LST, she authored her first book, Methods in the Madness: Diversity in Twentieth-Century Christian Social Ethics, Carlisle: Paternoster Press, 2004, and held leadership roles including Acting Principal in 2007-2008. Born and raised in Saint John, New Brunswick, she is a two-time graduate of ADC, and served churches in New Brunswick and Nova Scotia. She has preached, taught, and offered organizational leadership across Canada and Europe, including the Baptist World Alliance and the Baptist Union of Great Britain. Robbins will succeed Rev. Dr. Harry G. Gardner, following 12 years of skillful leadership. Acadia Divinity College is the Faculty of Theology at Acadia University and is the seminary of the Canadian Baptists of Atlantic Canada. Acadia Divinity College offers theological education at the bachelor’s, master’s, and doctoral levels, equipping men and women for leadership roles in churches, chaplaincies, denominational leadership, university and seminary teaching, cross-cultural mission, para-church leadership, and other areas of ministry. Graduate degrees are approved by the Association of Theological Schools in the United States and Canada. All degrees are awarded by Acadia University. For more information about Acadia Divinity College, visit our website at acadiadiv.ca.